Through magical realism and archetypal images "Singularity" chronicles the life of a character with no name, the Other, whose counterpart is the One, a symbol of intellection. The fourth in the series, it concerns the genesis of community, and the development of goodness in the Other who has until now been an anti-hero. Fear, Idealism, Force, Political Power and the overwhelming potency of Unity itself all are personified in the gathering of humans, here called homotheria. 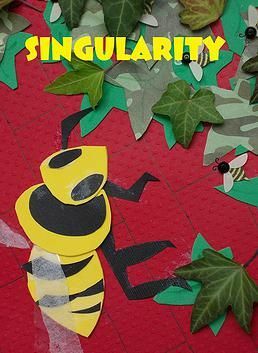 Encapsulating the intricate enigma of solidarity and existence, "Singularity" presents its readers with a philosophical puzzle – not an investigation of appearance and reality, but a conviction that reality is not reality. Shellko's latest work is a dark, sardonic, and deeply humorous look at both average and not-so-average human beings and their attempt to live together in community. The comic veracity of its portrait of humanity in communal life is rooted in philosophical reflection on fundamental questions of identity, tradition, autonomy, human potential, and self-determination; it finds both humor and horror in the flight from, and the fight for, authenticity. The latest chapter in the ongoing story of the raven-haired youth, 'the rising man', finds Shellko's archetypal protagonist pitted against Kafkaesque icons of mediocrity, conformity, and judgment, as he struggles to find meaning and to forge his own destiny in an ambiguous world. "Singularity" reads like a playful, complex and erudite murder mystery, brimming with fascinating characters and mysterious communities. -Dr. Clara Orban, author of "Terra Firma"
In this masterful blurring of the material and the metaphysical, Shellko has produced a powerful work containing not only the best of all literary worlds, but also more worlds than we thought were possible. -Kanu Bonyin, author of "Why I like Certain Letters More Than Others"
With the author's signature Kafka-isms, sense of fantasy, and strangely human archetypes, the narrative weaves philosophy, logic, myth, morality, and social commentary into one great tapestry of ambiguity — raising questions with a language that is lucid, refreshing, and often highly entertaining.